The Paris Opera continued their 350th anniversary celebration January 26 with a brand new production of Alessandro Scarlatti’s 1707 oratorio Il Primo Omicidio ovvero Caino. Alessandro Scarlatti (1660-1725), not to be confused with his son Domenico Scarlatti, was a very influential Italian early Baroque composer, even considered the founder of Neapolitan operas. Born in Palermo, he wrote around 63 operas and numerous oratorios as maestro di cappellain Naples and Rome. In 1707, he traveled to Venice and it was there that this oratorio was premiered, most probably as part of the Carnival instead of in a church. The libretto of Il primo omicidio provides little information about the librettist and the autograph score of the work only included its completion date: January 7, 1707. With Il primo omicidio Scarlatti created a remarkable musical interpretation of the Old Testament tale of Cain and Abel, using the individual instruments in an extremely original way. The work portrays the first murder in the history of humanity (hence the title). In summary, Adam and Eve bemoan their fall after their expulsion from Paradise. Abel, wishing to comfort his parents, promises to sacrifice a lamb to God. But Cain, as the first-born, claims it is his right to perform the sacrifice. After God favors Abel’s sacrifice instead of Cain’s, aggressive and murderous thoughts descend on him (he even hears the voice of Lucifer encouraging him) and subsequently, he slays Abel. God condemns Cain; the first murderer is filled with remorse. In the end, Abel’s voice is heard describing celestial bliss and the voice of God promises salvation. It was easy to see why Paris Opera chose to present this “sacred entertainment”, it was nothing short of Baroque Biblical thriller. After all, God and Lucifer confront each other in the very soul of Cain, Abel’s voice soars high from heaven, plus the almost expressionistic music – all screams drama on stage. To bring it to life, they entrusted the production to the hands of Baroque specialist René Jacobswith his B’Rock Orchestra, and director Romeo Castellucci, who had success bringing another biblical tale on Paris Opera stage, Schönberg’s 12-tone opera Moses und Aron that opened 2015-16 season. Alas, this first murder, as seen last Saturday (1/26), wasn’t a perfect crime, so to speak. In fact, it was very frustrating for me in so many different levels. More than 20 years ago, Jacobs recorded an almost definitive version of Il primo omicidio with Akademie für Alte Musik Berlin and Bernarda Fink as Caino. As with recent CDs with his new Baroque band B’Rock Orchestra, Jacobs tinkered a lot with the orchestration of Scarlatti’s score. Probably to accommodate the size of Palais Garnier, he doubled the size of the orchestra, resulting his current reading lost the athleticism and charm that imbued his prior recording. Even more damaging was he added a lot more extraneous noises, particularly the overworked wind machine that threatened to drown the orchestra during the Sinfonia describing the killing scene! The very static nature of most oratorios, mostly written as commentaries of the plot rather than describing the actions themselves, require a determinative hand and a clear dramaturgy to make it work as staged drama. The best example of this was, in my opinion, Claus Guth’s beautifully moving staged production of Handel’s Messiah, a work that was actually much more episodic than Il primo omicidio. It was not enough to just let the work “speak for itself”! I feel that with this staging, Castellucci failed to achieve that. In the Robert Wilson-esque First Part, Castellucci simply placed the singers in front of a giant silver screen the whole time, aided by a number of props and some stylish synchronized hand gestures. It was fine on its own, but I couldn’t help thinking that the Part 1 in its entirety was nothing more than a dressed-up concert reading! 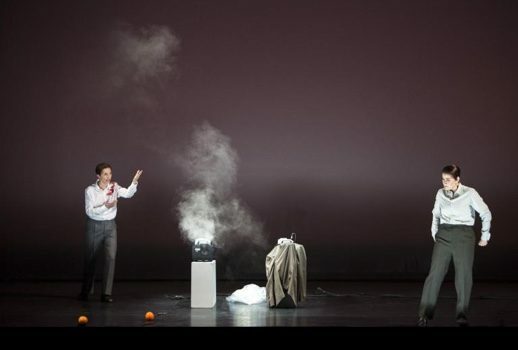 The choices of the props were variable; Castellucci used different sizes of smoke that came out from Abele’s and Caino’s sacrifices to identify that God favored Abele’s, and that was effective. However, the “lamb” that accompanied Abele’s first aria “Dalla mandra un puro Agnello” was downright laughable, as it was in the shape of blood bag (and he pierced it on stage to smear on his shirt). Likewise, while the various spotlights strategically placed behind the screen give a supernatural feeling to the whole proceeding, I found that the Hulk-like figure that was projected during Adamo and Eva’s duet “Adherite… Obedite… ò Figli miei” more than likely distracted the audience. In addition, I think Castellucci missed the opportunity to potray what was supposed to be the spectacle of Part 1, the dueling thoughts from both God and Lucifer in Caino’s head! Castellucci completely shifted gear for the Second Part, and we were finally afforded with full view of the stage, as the curtain opened to Caino’s digging on the field (as specified by the libretto for his opening aria “Perché mormora il ruscello”). Abele approached him for his arioso “Hor se braman posar la fronda”, and what followed was the biggest pièce de résistanceof the night. As the action progressed for the killing, a child actor, in similar clothes, doubled Caino’s movement and mimed his words, and progressed to take over the action and did the actual killing of Abele! From then on, every action on the stage was done by child actors (they had doubles for each character and even for the crowd scenes), while the singers relegated to sing from the pit. I’m not totally sure what it symbolized, all I can think of that it might represent innocence lost. Practically speaking, the decision of placing the singers on the pit created a rather jarring sonic experience (at least from my seat in the back of the Orchestra) as the voices now came from much forward location and blended more with the orchestra, and the miming by the children was not always synchronized. Equally perturbing was, later on, bloody Abele child actor was also shown to be stripped and bathed by a group of other children, in a scene that mirrored Lamentation of Christ (Castellucci obviously drew parallel between Abele and Jesus off the cross there). I was surprised that Castellucci could get away with this in Paris, while I think this would be highly controversial in the US. The six singers were mostly fine, without being particularly distinctive. Kristina Hammarström, probably the most impressive of the bunch, smartly used her lyrical instrument to navigate various change of mood in her Caino’s arias and duets, and she acted extremely well as the tortured soul. If anything, I wish she would be angrier in the pivotal scene of Part 1, but it might also be directional choice. Olivia Vermeulensounded sweet and angelic as Abele, however her timbre was very close to Birgitte Christensen (as Eva). Thomas Walker took a while to warm up that night, but eventually he settled alright. Robert Gleadow sang Lucifer in full voice, and he clearly was having fun with it, as he provided the most animated character of the night, particularly in rip-roaring “Nel potere il Nume immita” in Part 2. Pity that he was buried in the pit, while the child actor portrayed him wasn’t as explosive! I found it intriguing that Jacobs chose Benno Schachtner as the Voice of God (Jacobs sang the role himself in the previous recording), as I found him to be lackluster and his top was rather problematic. All in all, it was an okay night at the opera, without much gained from the performance. The audience gave polite applause to the performance, with the loudest cheer reserved to Jacobs himself. While I enjoyed hearing the rare oratorio being performed, I feel that night didn’t showcase it in the best light and justify its neglect. This was such a pity, as the score is strikingly lovely, and in stronger hands (like Jacobs’ own older recording) it can provide much enjoyment! In the same year Il Primo Omicidio was written, 22 year old Handel composed his first ever oratorio, Il Trionfo del Tempo e del Disinganno (The Triumph of Time and Disillusion), to an Italian-language libretto by Cardinal Benedetto Pamphili during his stay in Rome. It was met with great success, and opened doors for Handel subsequently. He himself clearly loved this piece that he recycled it twice; first as Il trionfo del Tempo e della Verità (The Triumph of Time and Truth) 30 years after composition, and finally it resurfaced 20 years later as Handel’s final vocal work, the English-language The Triumph of Time and Truth. This charming oratorio has been enjoying something of a renaissance lately; particularly since the very high-profile Krzysztof Warlikowski’s production that opened Festival Aix three years ago. This year alone, opera database Operabase listed three separate staged productions in 4 countries. I managed to catch a concert version last Sunday (January 27) at the Chapelle Royale Versailles, featuring a new period band, Les Nouveaux Caractères, led by Sébastien D’Hérin, and featuring 4 soloists mostly unfamiliar to me. If you’re not familiar with Il Trionfo, there are four characters in this oratorio: Bellezza (Beauty), a young woman; Piacere (Pleasure), a young man (described as a charming youth of sixteen, hence a soprano role); Disinganno (Counsel/Enlightment), a rather older man (and an alto); and Tempo (Father Time), a tenor. The action comprises the three male characters trying to influence Bellezza to follow their persuasions, Tempo and Disinganno acting together against Piacere. In a nutshell, the story is the conversion of Beauty from a yearning for worldly enjoyment to an aspiration to more secure rewards, hence it is a morality play. Obviously, as this was written by a Cardinal, its end is dependence on God, as Bellezza asks for the aid of the angel sent to her from Heaven to receive her conversion. That fact is important to point out, as with the advent of countertenors, the roles of Piacere and Disinganno have been sung by men. In fact, in the staged version currently playing in Moscow, even Bellezza is sung by a countertenor, a practice that I really have problems with, as to my ears, Bellezza requires a soprano timbre to make significant contrast with the other 3 characters. In this performance that I saw, Piacere was sung by a soprano, while Disinganno by a countertenor. My interest to this performance was piqued by the one soloist that I’m familiar with, the mezzo Karine Deshayes as Piacere. She certainly didn’t disappoint. My favorite Piacere is still the amazing Ann Hallenberg from Emmanuelle Haïm’s 2007 star-studded recording, who gave an elegant yet playful account. Deshayes’ reading stood in between Hallenberg’s version and superstar countertenor Franco Faglioli’s acerbic take on Warlikowski’s production. Her “Lascia la spina”, the most famous aria from this oratorio (which later on reworked to be “Lascia ch’io pianga” in Rinaldo), was significantly heartbreaking, and drew a long applause from the audience. Played faster than usual, the aria, where Pleasure tried one last time to persuade Bellezza, sounded more like desperation rather than pity and Deshayes, aptly supported by D’Herin, really explored the depth of the texts with eloquence. In her final aria “Come nembo”, Deshayes showed that she was fully capable of being menace, while demonstrating her formidable coloratura skills! The biggest discovery of the night for me was the Italian countertenor Raffaele Pe, who was singing Disinganno. Prior to the concert, it was announced that Pe had a sick child back home, and he flew in just for the concert and flew back that night. Full commitment aside, I was pleasantly surprised to find Pe’s voice was warm, full of colors, and particularly I was impressed with the ease he produced the sound, usually my problems with countertenor voices. To me Disinganno is almost a thankless role in this oratorio, as a lot of his lines are doubled (and often overshadowed) by Tempo. Right from his opening aria “Se la bellezza”, Pe projected a calm, supportive “Counsel”, while at the same persuasive enough to change anybody’s mind. It was truly a voice that made you sit and listen, and I wish to hear him more in the future. As Tempo, the Father Time, Julien Dran might not as authoritative as I would like Tempo to be (like Michael Spyres in Warlikowski’s), but he still made his presence felt. His bright tenor matched well with Pe’s Disinganno, and they showed great chemistry together. Any performances of Il Trionfo eventually stand and fall with whoever sings Bellezza. After all, this oratorio is her conversion story, and she – the personification of us human – goes through anxiety, denial, fear, loss and grief to detach herself from Pleasure to higher aspiration. In that sense, I feel Caroline Mutel, who founded Les Nouveaux Caractères with D’Herin, stopped short of being a great Bellezza with her interpretation. She did sing well, and navigated her many coloratura passages quite carefully, but unfortunately her top notes sounded rather constrained, and it became more apparent as the concert progressed. This was particularly obvious during the quartet “Voglio Tempo”, my favorite part of the oratorio, where Handel brilliantly showed how Bellezza tries to hold time still by sustaining the high notes on the word “Tempo”. Here she was struggling with those sustained high notes, and somewhat ruined the nice effect that Handel set musically. D’Herin led his ensemble Les Nouveaux Caractères with vigor and excitement. I am constantly surprised with the seemingly continuous influx of high-level period-instrument orchestras in Europe, and Les Nouveaux Caractères are definitely no exception. Furthermore, they imbued that performance with a sense of community, as every personnel supported each other and even cheered when their colleague performed well. In turn, all that elevated their playing to the highest level, and it was truly marvelous to witness. All in all, it was a lovely presentation of Handel’s masterpiece at the Chapelle Royale. As a last note, the Chapelle Royale is stunningly gorgeous space to be, however the high ceiling of the chapel unfortunately does create echoes, particularly the further away from the stage. If you happen to see a concert here, it is advisable to sit as close as possible to the stage.